18 months ago, whilst on holiday at the Isle Of Wight, I decided to try and photograph the Milky Way. When I say try, it’s because I hadn’t previously attempted this type of photography, known as Astro, so my first objective was to locate the Milky Way and then set about capturing it with my camera. Until this point I had never seen the Milky Way – I had only seen very recent photographs of it during a brief research earlier in the afternoon. At the time, during the Summer of 2014, the Milky Way stretched across the night sky from South to North, so I decided on a location to head to and set about the task of photographing it. The night in question will always be a one to remember, especially when I first saw the Milky Way for the very first time, in pitch black conditions, which was ideal as it stood out like the proverbial sore thumb. Photographing it was a lot easier than I had imagined. Infact, the hardest part of the whole experience was keeping my nerve, as the location was out in the sticks and under a blanket of pitch darkness, but I got the shot I wanted and that was very satisfying. 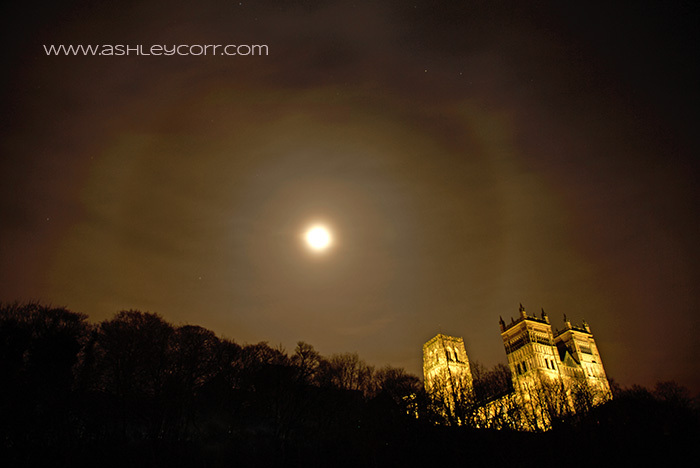 And that was my introduction to Astro Photography, the night it all started for me and which continues to this day. Astro Photography has lots of strings to its bow and it can be quite addictive, especially Aurora chasing, which I’ve been doing for a year, since my first sighting on 29 December, 2014. 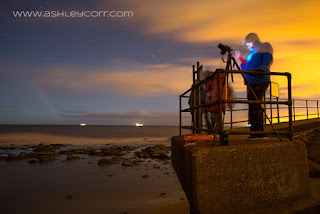 This brings me nicely on to today’s blog entry – another Aurora chase on the Northumberland Coast, almost a year to the day when I first saw the Northern Lights with my own eyes. In the hours prior to our road trip north on the A1(m), my mobile phone received lots of Aurora alerts through an app I have installed on it. A CME (Coronal Mass Ejection) had fallen from the sun two days before and was earth bound, which in turn causes the natural phenomena known as Aurora Borealis (or Northern Lights). The strength of the magnetic storm is measured in KP units and a reading of between 4 and 5 is usually the least you need to be able to view the lights from the North-East coast of England. Other factors need to come into play too, such as BZ, a reading which is created by waves and other disturbances in the solar wind. The further south the BZ reading is, the better chance of a display. Today the Aurora forecast was KP8 and the BZ was as far south on the dial as it could be. I’d never seen a forecast as strong as this so I wasn’t gonna miss an opportunity to get involved. We arrived at Craster at 6pm and headed across the pastures to Dunstanburgh Castle, an ideal location looking North, in the direction of the Aurora. Clear skies had been predicted on the Met Office app, but by the time we reached the castle a huge cloud bank was heading our way. Not in the plan at all. A green glow could be seen in front of us and it was quite high in the sky – much higher than I’d seen before. It was very windy upon the crag where Lilburn Tower is perched and the winds got worse as the night wore on. A steep drop to my left wasn’t an ideal place to set up shop, but the vantage point was the best I could find considering a few other photographers were in place alongside us at this point. Over the next four hours we waited for the clouds to disperse, which they did to some extent, but as they headed north it was the last place we wanted to see them. Any colour that was on display was clouded out and before long we were closed down altogether. The plan was falling apart and although those mad KP alerts kept on coming through, the clouds made sure we had little or no chance of seeing the display we had earlier expected. Home time. After the 30 minute walk back to the car, feeling somewhat deflated, I reflected on the one decent shot I managed to pull in (see above). Not a great display be any means, but at least I got something for my efforts. The night wasn’t a complete cloud-out however. 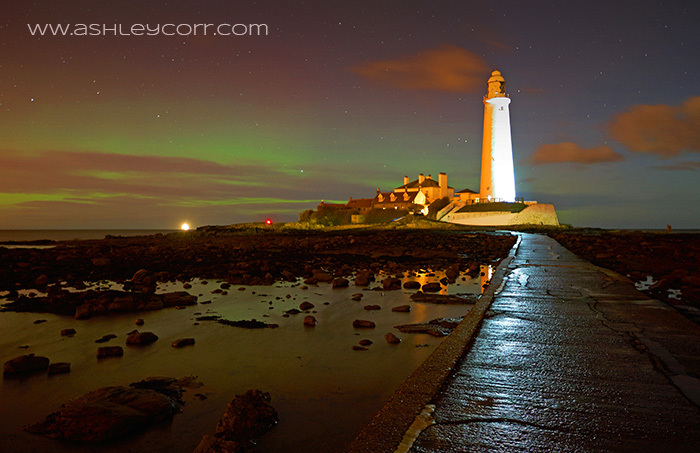 We decided to stop off at St. Mary’s Lighthouse, Whitley Bay, on the off chance that the Aurora may still be firing closer to home. It was around midnight when we arrived and a green glow could be seen behind the Lighthouse. The tide was incoming and the late night display had brought plenty of photographers to this location, eager to catch a few shots of the display. 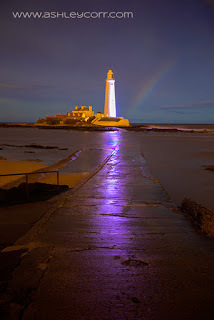 A Lunar Rainbow could be seen next to the Lighthouse, which a first for me, so I quickly grabbed the opportunity to photograph it before it faded, which it did in a matter of seconds. 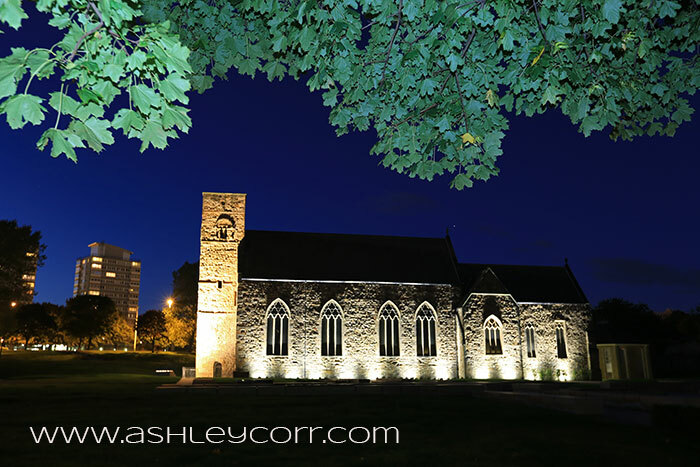 We spent a couple of hours at St. Mary’s, hoping to see an upturn in fortunes, but the Aurora never really got out of second gear the whole time we were there. Again, I grabbed what shots I could before calling it a day, or night in this case. The night had so much expectation riding on it, but looking back now it was a big disappointment. Maybe I expected too much, but then again… when a KP8 forecast comes through, along with a weather forecast of clear skies to the North…well, you can’t help but get drawn in by it all. 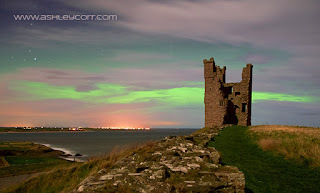 Experience tells me that most Aurora chases often turn out to be a waste of time and effort. The best ones I’ve been involved in have been very much unexpected, so you learn to simply go with the flow, cross your fingers and hope you hit lucky. You win some and you lose some, it’s all part and parcel of the game. I suppose that’s what half the attraction is. I wouldn’t change it if I could. The expected or unexpected? It is what is. I’ll keep on chasing (wink). Earlier in 2015, the grounds of St. Peter's Church (674 AD) in Monkwearmouth, Sunderland were subject to a landscape revamp, a face lift that transformed the Southern section of the site. Following public consultation and discussions with the Durham Diocese, the project was given the green light and works started at the end of October 2014. 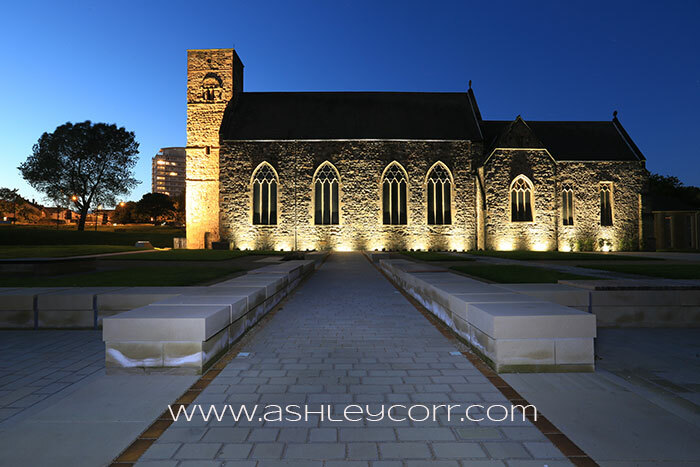 The landscaping includes informal seating positioned within the Monastery footprint, new footpaths and resurfacing of existing footpaths, a new main gateway, new parking areas, new lighting, improved signage and links to the riverside, plus the planting of semi-mature trees and shrubs, and the creation of wildflower areas. Sunderland City Council has funded the £1million project which is due for completion in spring 2015. 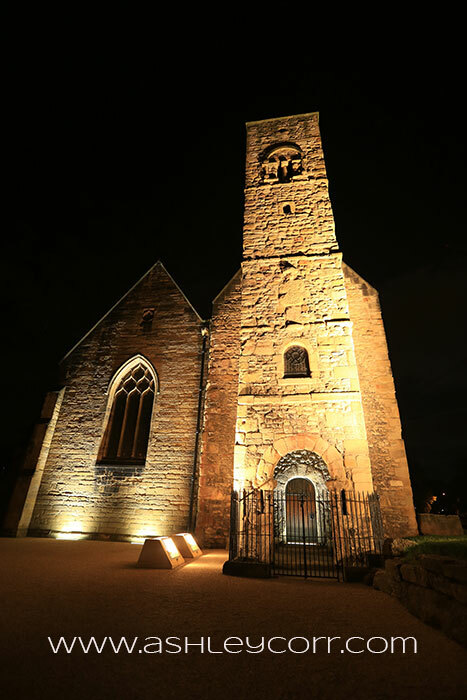 Plans are already underway for events and activities to take place to celebrate the site and its heritage next year. Upon arrival at the site the main gateway marked the introduction to the changes that had been put in place, with large masonry blocks flanking the wrought iron gates, etched with the name of the ancient church and the year in which it was built. Just inside the gates there was car parking bays to the left - a noticeable change from times gone by, and one which had me thinking the cars were better off outside the grounds rather than within. A quick walk down the path towards the church and then off to the right brought me to the area where most of the landscaping had taken place. A job very well done, it has to be said. Last but certainly not least, the lights. I had a brief chat with the vicar, who just happened to be walking his dog in the grounds. He informed me that the new lighting consisted of LED bulbs that are very economical to run and the costs equal a fraction of what the original costs were a few years ago before they were eventually switched off altogether. 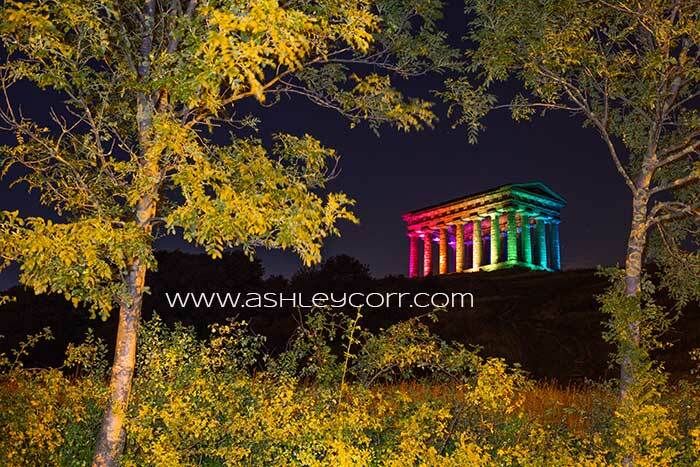 After a long absence, the lighting system at Penshaw Monument has returned in all it's glory...and more! 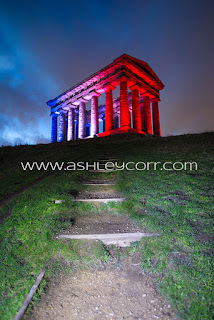 For many years the Monument was lit up from dusk till dawn and it could be seen from many miles around, as it dominated the skyline and rightly placed itself highly in the ranks of North-East iconic Landmarks. 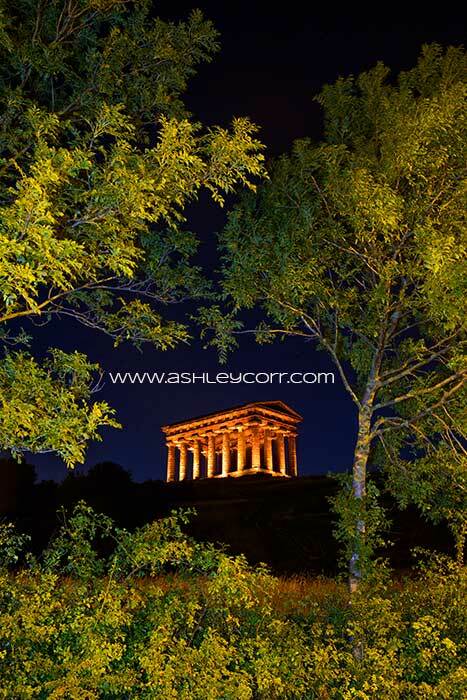 To be fair, Penshaw Monument was always 'Up there' with the best of the rest in our region, but it was the idea of lighting it up that really propelled the icon to another level, showing it in it's best form - even better close up. Industrial strength halogen lights were initially installed and Sunderland Council met the cost, with the help of local tax payers of course (wink). 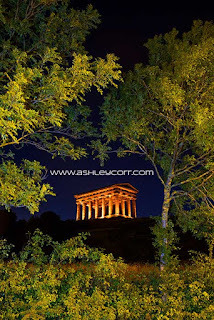 Illuminating Penshaw Monument, a folly built in 1844 on Penshaw Hill between the districts of Washington and Houghton-le-Spring, was exactly what is deserved. Climbing the hill covers a distance in height of 446 feet, and although I've climbed those steps hundreds of times before, I'll probably do it all over again, although each climb seems to get that little bit tougher as the years pass. Although many a nice shot can be had from the foot of the hill, you simply can't visit without taking in the views from the top and inside the columns of the Monument. Although quite windy at times, it's well worth braving the elements to grab the visitor experience in full, so avoiding the climb isn't an option for me. Up I go. 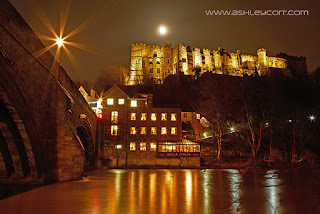 Two years ago the original lighting was replaced with a hi-tech LED lighting system. 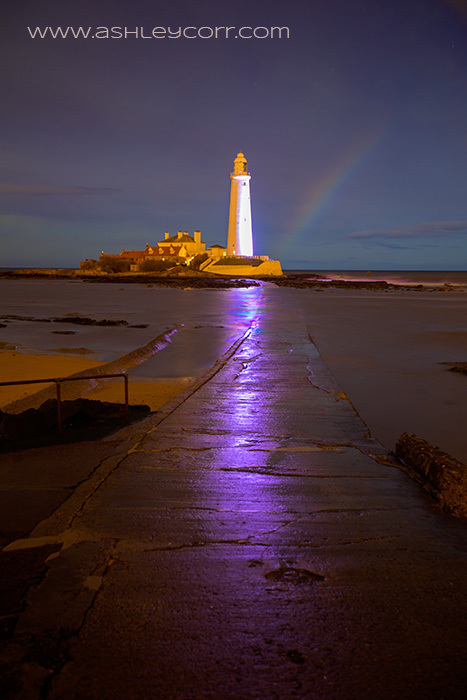 The Philips Colour Reach lights cost in the region of £46,000 and once again Sunderland Council were dipping into their fully laden pockets to fund the project. 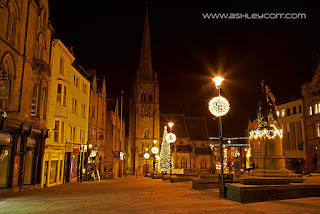 No sooner were the lights in place and ready for the big switch on, when they mysteriously vanished. Aye, nimble fingered thieves decided to remove the lights and that was that. Standstill, for many months. A real pity and one that wasn't gonna deter Sunderland Council for too long, although admittedly it seemed to take an age before their contingency plan was up and running. And the plan was...well, a new set of lights of course. Security of the metal housing was beefed up somewhat to avoid a repeat performance, resulting in even more money down the drain, so here we were...ready to go once again. About time too. 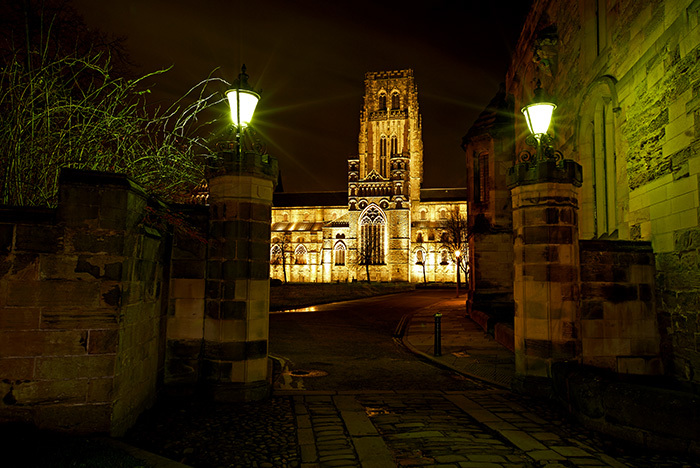 The new lights will reduce energy costs by up to 80 per cent and save around £8,000 a year in running costs and will provide a softer white effect allowing the true colour of the monument to be seen. Altogether, 18 floodlights mounted within enclosures at the base of each pillar were installed. The floodlights can also be programmed to display colour changing light effects meaning special anniversaries or events such as football celebrations could be highlighted in colour on the monument. At the tail end of August 2015, I grabbed my first shots of Penshaw Monument and it's new lighting system. The transformation was a real eye-opener, especially when the landmark had been in complete darkness at night for many months. We had our icon back to its former glories and hopefully this time round it would remain that way. The original switch saw the Monument in it's previous colour, a warm yellow, which was looked prefect on the stonework, but was it wasn't long before the lights would be displayed in a totally different way. Colour cycles were performed at timed intervals, in multi-coloured displays. Sunderland Gay Pride weekend coincided with a rainbow effect display, which is shown here and by far being the most spectacular show to date. 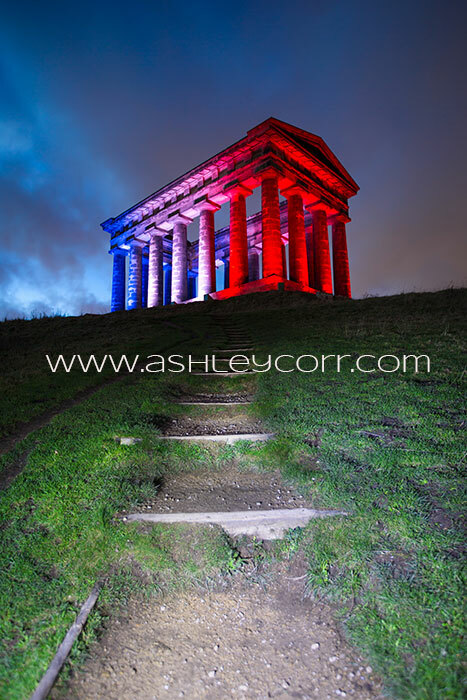 The terrorist attacks in Paris during November 2015 marked a full week of respect by Sunderland Council as the Monument was lit in the colours of the Tricolor (French National Flag) to honour the many innocent lives that were lost. 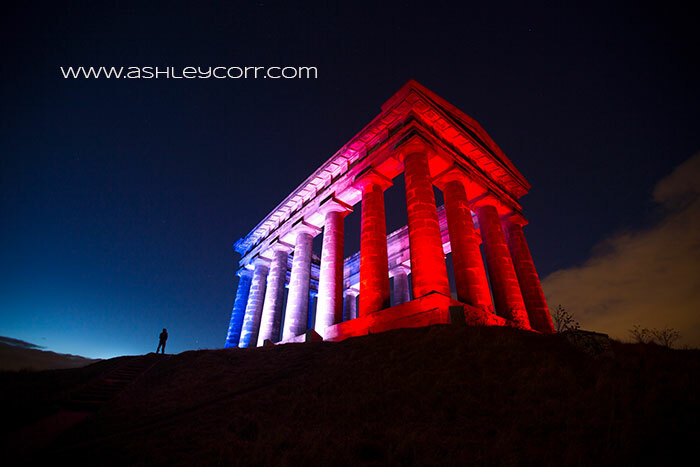 This attracted thousands of visitors to Penshaw Monument as another mark of respect during the week the blue, white and red colours were on display. Again, I made another short visit to the site to pay respect and join in with many others who took photographs.